Go on a breath-taking treasure hunt with Vikings’ Voyage! This video slot features splendid bonus games, handsome jackpot sums, and plenty of pleasure. The slot is attractive artistically, which is another plus every time you play the Playtech slot. Make the first bet and get on the Vikings’ boat. Every payline is activated with one coin. Overall, with twenty paylines and the maximum cost of $5 for a coin, your highest bet can be as high as $100! Your quest for Scandinavian treasures will not take too long a time; however, during your sea voyage you will still be able to collect some prizes with the help of card symbols. Although they have little worth, their frequency cannot but please you, adding to your gain. As the evening descends, the Vikings start to feast. You will have plenty of fun if you join them and make a combination of Cup and Coin symbols. These two will bring you 500 and 1,000 coins correspondingly. Before trying to free the beauty from the dungeon, your Viking squad needs to get armed. The Axe symbols will come in handy. The winning combination of these will bring you several thousand coins! Now, be ready to fight for the princess. The winning combination of five Princess symbols means that you’ve just won the minor jackpot of the video slot. 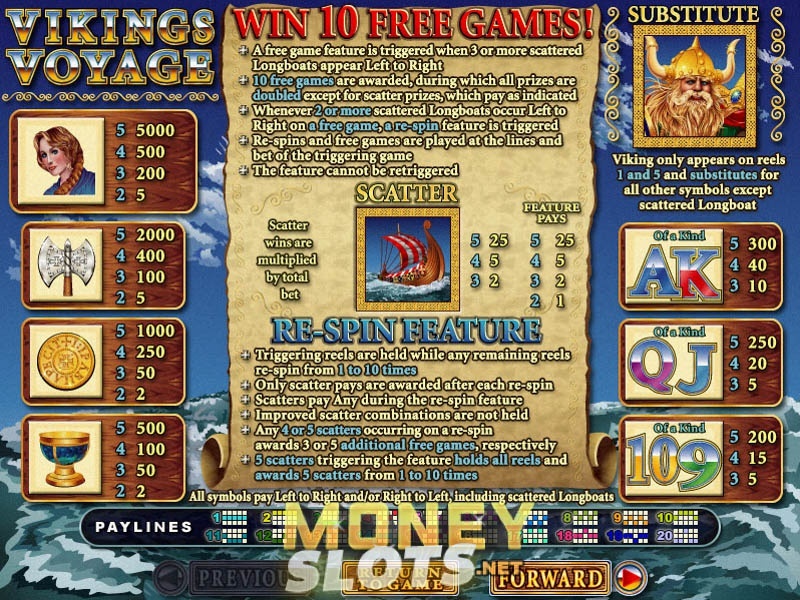 The captain of your longboat, the brave Viking, will help you complement winning combinations. After all, he represents the wild symbol of the game! The longboats, floating across the screen, are the scatters. Besides, they can activate bonus games, where you can get ten free spins or become the boss of the reels. Vikings’ Voyage invites you to embark on a fabulous journey filled with danger and precious rewards. Join in!